Bob Moyer may have been traveling in Japan in real time, but in his reading world, he’s been in post-war Germany, courtesy of the latest in one of his favorite series. PRUSSIAN BLUE. By Philip Kerr. Putnam. 523 pages. $27. In this now-venerable series, Bernie Gunther has made his melancholy way from Berlin cop to valued investigator for the Nazis to a concierge alias Walter Wolf on the Mediterranean coast. In the last installment, that cover was blown. Bernie takes off, not wanting to play a part in Mielke’s fairy tale. As he races toward the German border, he reaches into the past to recall the case in which he partnered with Korsch. Korsch becomes the thread that ties Bernie’s escape in the present to his excursion into the past, and makes this a two-for-one tale. Back in 1939, Reichsfuhrer Heydrich had ordered Bernie to investigate a sniper killing at Berchtesgarden, Hitler’s monumental retreat in the mountains. The Nazis spent millions on it, “Money that could have been spent on something more important than the comfort of the madman who now ruled Amer —(oops, Freudian slip) Germany.” The Fuhrer’s safety has been compromised, and Bernie has only days to solve the mystery before Hitler arrives. Of course, he must do so while negotiating the politics of the powerful surrounding Hitler. 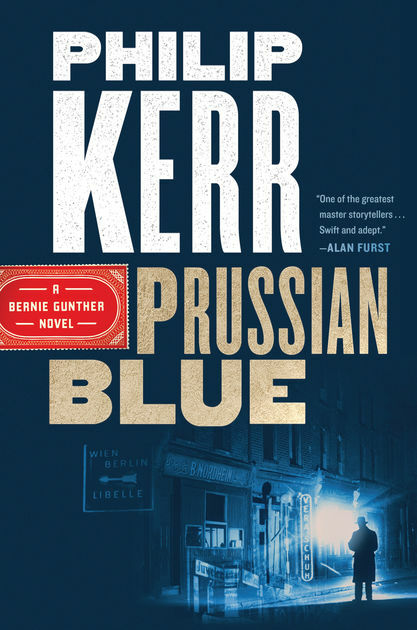 As usual, Kerr uses Bernie’s investigation to throw light on the horrific history of the Nazi regime. As Bernie travels through the rooms and rumors of Hitler’s aerie, he uncovers uncomfortable truths that endanger him at every turn: a brothel run by Hitler’s doctor, paybacks to high officials, use of the drug Pervitin, abuse of that same drug, and the bitter struggle between two of Hitler’s most trusted advisors, the Borman brothers. With Germans all around him, Bernie might not escape alive from France. Although disguised successfully as a Frenchman (“All I needed now was to neglect my personal hygiene, and to obtain a service medal for a war I hadn’t fought in.”), he can barely evade the French police complicity with the Stasi. Tension builds as he nears the border. Korsch was close beside Bernie on the mountain, but he’s closer behind him in France. Needless to say, this is a series and Bernie survives — until he gets a new identity in Germany. Bernie Gunther and Walter Wolf are dead — long live Christof Ganz! This entry was posted in Thriller/Suspense and tagged Bernie Gunther, Philip Kerr, thriller. Bookmark the permalink.